For years I was intimidated by the thought of making an authentic French Onion Soup. Recipes I had read made it sound like it would take days. It seemed way to complicated and time consuming. 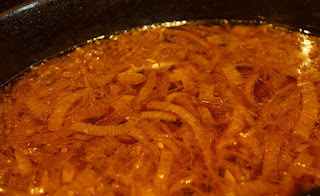 Then I talked to a dear friend who is, in fact, a chef who "poo-pooed" the idea that delicious, homemade onion soup was difficult to accomplish. With that I decided to take on the challenge. I took out calories where I could without sacrificing flavor and I kept the process as simple as possible. There are many wonderful things about onions. They are a nutrient dense food which also means they are low in calories. There is evidence to show they are heart healthy, diabetes and cancer fighting, mood boosting as well as great for our skin and hair. And on the practical side, they are a food with a long shelf life so they are easy to keep on hand, ready to be used in any recipe. Check out the recipe below. My family loved it and we enjoyed it as easy meals for a couple of days during the week! 1. Spray slow cooker with cooking spray. Add butter, thyme and bay leaf to pot. Next place ten onions and sprinkle them with sugar. Cover and cook on HIGH for 8 hours. 2. Remove the sprigs of thyme and bay leaf; discard. Add stock, vinegar, salt and pepper. Cover and cook on HIGH for 30 minutes. 3. Preheat broiler to high. 4. Arrange bread in single layer on a cookie sheet; broil each side until browned. Next place a generous ½ tablespoon of cheese on the top of each slice of bread. Broil until melted. 5. Fill right-sized soup bowls with 1½ cups of onion soup. Top with two slices of cheese topped baguette. Serve hot. Serves 12. Serving size 1½ cup soup with 2 slices cheese topped baguette. Crisp or Crumble- is there a difference?